One of my biggest takeaways from Dark Nights Metal #2 was the introduction of Batman Who Laughs, a horrific and disturbing Dark Universe version of Batman and his four deadly “pet” Robins. Their introduction was gruesome and something straight out of a horror film and I loved it. 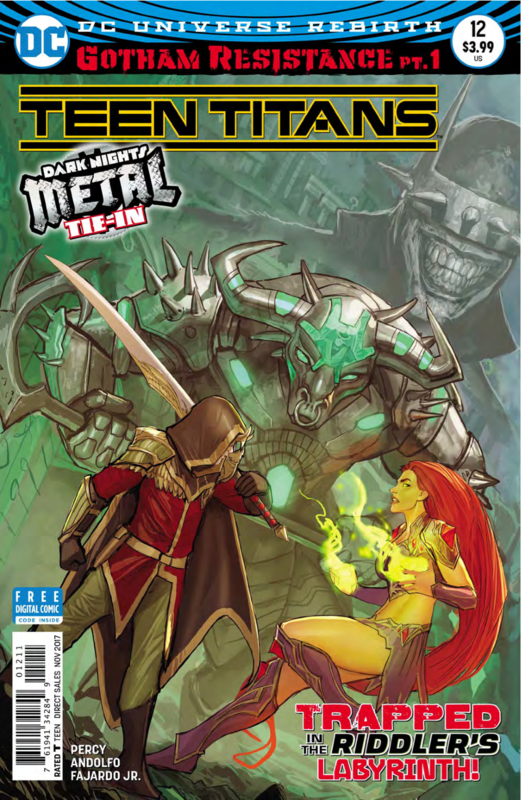 The idea that this issue continues to look at Batman Who Laughs was another smart move because, I’m sure, like me, many fans wanted to see more of him and we definitely got more. His set up scene in this issue was chilling and is exactly what I wanted to see more of. However, he isn’t in the entire issue and even the cover art hints at that too. He’s working in the background and I can appreciate that -- we don’t get too much of him all at once, just a little taste until we get his one-shot special. 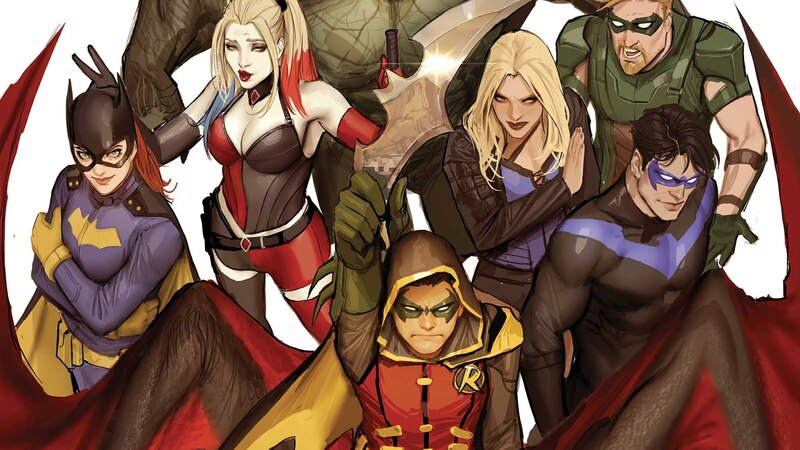 The rest of the issue is Robin taking on Riddler’s Labyrinth alone and teaming up with Green Arrow, Harley Quinn and Killer Croc along the way and it’s a fun adventure. Nothing too big or exciting happens and the Riddler is defeated anti-climatically. It’s set up earlier that Batman Who Laughs gives some villains in Batman’s rogues gallery some metal Joker cards that give each of them a different ability and set up in each ring that is surrounding Gotham, acting as one huge labyrinth. It’s a nice set up for future tie-in issues that give each book a chance at a ring level and a different villain to work with. The issue ends with Nightwing running from an ice monster from the second ring, with an awesome looking costume I might add. I’m excited to see what his challenge is and can’t wait until next week to continue this brilliantly planned tie-in story. Teen Titans #12 was a fun issue with amazing art. 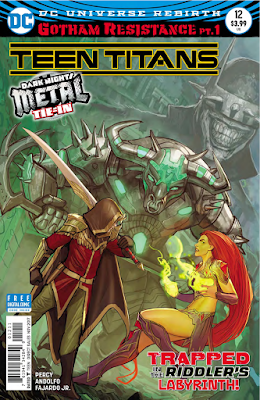 It’s great set up to a brilliantly crafted tie-in story that will give each of its tie-in books a chance to shine in the Metal event. 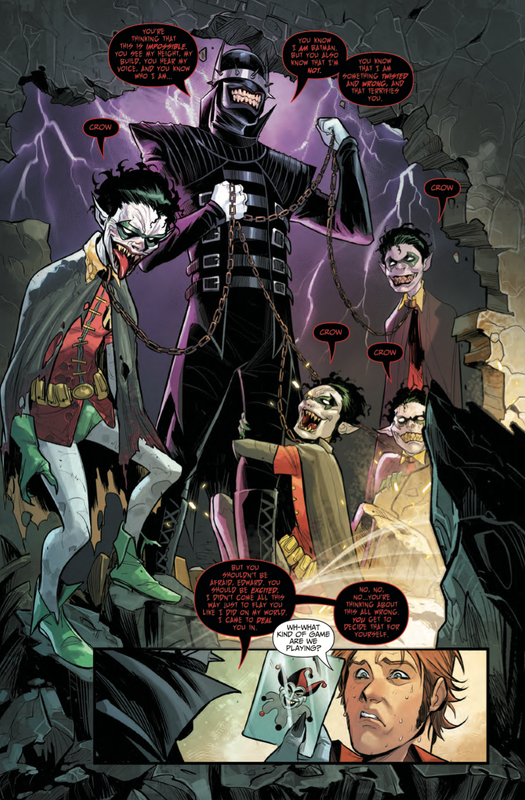 The little taste of the horrific Batman Who Laughs is amazing and I can’t wait to see more of him and the other evil Batmen.